Be the first to review this 2019 Nissan Frontier. The 2019 Nissan Frontier marks a milestone: The compact pickup truck has been on sale since 2004, without too many major changes. None for 2019 in fact, after a big year in 2018, when it added air conditioning, cruise control, Bluetooth, and a rearview camera to the base S model. Modern active-safety features, such as automatic emergency braking or even blind-spot monitors, aren’t available on any Frontier. The 2019 Frontier is a basic pickup for those who don’t need more. It’s a rear-wheel-drive truck with available four-wheel drive. There are two engines, either challenged or robust, take your pick. The 2.5-liter 4-cylinder carries a big burden, making a marginal 152 horsepower and 171 pound-feet of torque. The 4.0-liter V-6 with 261 horsepower and 281 pound-feet better handles the workload and is more popular. The 4-cylinder engine would make more sense if there were a simple work truck version with a bench seat to carry three people - but there isn’t, only an extended cab called King Cab. It mates with either a 5-speed manual gearbox or 5-speed automatic transmission. We’re not sure why the automatic costs nearly $4,000 more than the manual in the base S model, but it’s not worth it, especially not in a truck like this. The V-6 comes as King or four-door Crew Cab, and offers either a manual 6-speed transmission of the 5-speed automatic. The King Cab has a cargo bed that measures a tad over six feet, at 73.3 inches, and second-row jump seats that are reached through rear-hinged half doors that can only open when the front doors are open. Crew Cab models get four conventional doors, a regular rear bench, and either a short (59.5-inch) bed or the longer (73.3-inch) version. Ground clearance of nearly 9 inches helps make the Frontier competent off the road. Two of the five models focus on that ability. The rear-wheel-drive Desert Runner has a raised suspension with Bilstein shock absorbers and oversize all-terrain tires. The four-wheel-drive PRO-4X includes a transfer case and electric locking rear differential, making it even more capable. Fuel economy is relatively poor. The 4-cylinder with rear-wheel-drive and the manual gearbox is EPA-rated at 19/23 mpg City/Highway, or 21 mpg Combined - comparable to some full-size V-8 pickups. The expensive automatic drops the mileage to 17/22/19 mpg. 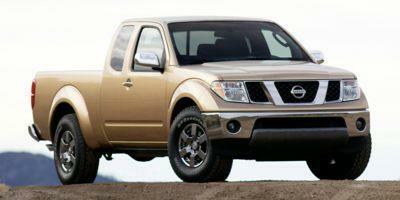 With V-6 power, rear-drive, and 6-speed manual, the Frontier is EPA-rated at 16/22 mpg City/Highway, or 19 mpg Combined. This time the automatic raises the highway figure to 23 mpg. The four-wheel-drive manual is EPA-rated at 16/21 mpg City/Highway, or 18 mpg Combined. The automatic manages only 15/21/17 mpg. The National Highway Traffic Safety Administration gives a three-star rating (out of five) for the frontal crash-test. No side-impact testing has been performed. Rollover resistance (a calculated figure) is only three-star for rear-drive models, but four stars with four-wheel drive. Crash-testing by the Insurance Institute for Highway Safety was a bit better, but not much. Both body styles scored Marginal on the small-overlap frontal-crash test for the driver’s side, but moderate-overlap and side-impact scores were Good. Head restraints were deemed Acceptable, but headlights Poor. Frontier pickups come in five trim levels: S, SV, Desert Runner, SL, and PRO-4X. As the vehicle hasn’t changed for 2019, neither has the price. Frontier SV King Cab ($23,460) comes with manual or automatic ($24,510), 4-cylinder engine, and adds power windows, locks, and mirrors, plus tinted windows and 16-inch alloy wheels. A Value Truck package goes further: dual-zone climate control, better audio, a leather-wrapped steering wheel, spray-in bedliner, parking sensors, and heated seats. Frontier SV King Cab V-6 automatic ($25,220) includes the V-6 engine and 5-speed automatic. Frontier SV King Cab 4×4 automatic ($28,110) gets the V-6 and four-wheel drive. Crew Cab versions are available with four conventional doors and rear bench, plus V-6 engine in Frontier S Crew Cab manual ($24,550), S Crew Cab 4×4 Automatic ($29,900), SV Crew Cab Automatic ($26,350), SV Crew Cab 4×4 manual ($32,380) and automatic ($29,540). A Midnight Edition option package for SV Crew Cab models spruces up the body with black wheels and trim. Frontier SV Crew Cab Long Bed automatic ($28,960) gets a long cargo bed and V-6 as does the SV Crew Cab Long Bed 4×4 automatic ($29,960). Frontier SL Crew Cab automatic ($33,560) has V-6, power front seats, leather upholstery, heated seats, navigation, and 5.8-inch touchscreen audio with navigation. Also available: SL Crew Cab 4×4 automatic ($36,400); SL Crew Cab Long Bed 4×4 automatic ($36,800). Desert Runner King Cab automatic ($25,900) includes the V-6, rear-wheel drive, raised suspension, Bilstein shocks, and 16-inch tires. Desert Runner Crew Cab Automatic ($27,330) is similar to Desert Runner King Cab but with four conventional doors, V-6, and rear-drive. PRO-4X King Cab 4×4 Automatic ($33,030) comes with V-6 engine, four-wheel drive, transfer case, and locking rear differential. PRO-4X Crew Cab 4×4 is available with manual ($32,740) or automatic ($33,790) with four conventional doors, V-6 engine, and four-wheel drive. One thing you can say about the Frontier is that it looks familiar. It looks like trucks used to look. It might be a long-lived look, but it’s a good one. We wish there weren’t so much chrome, because that detracts from the character, but we like the flared wheel wells that make it suitably tough. Adding to the ruggedness, the front bumper curves inward for better approach angles to climb over things like rocks or steep embankments. PRO-4X and Desert Runner versions cut back on the chrome, while the Midnight Edition package for SV adds black exterior accents and black 18-inch alloy wheels. That’s the best-looking Frontier. A roof rack can enhance utility, but looks like an afterthought and increases wind noise. If the blocky exterior feels comfortable because it’s old, the blocky interior just feels dated. It’s laid out in a sometimes confusing way, and the cabin is stocked with lots of plastic trim. The controls are simple, and the audio controls sit high. The optional Rockford Fosgate stereo system gets a small 5.8-inch touchscreen. The standard infotainment system is okay, although its components are behind the times, with small displays and lack of Android Auto and Apple CarPlay compatibility. The comfort of the front seats is average. They’re fine around town, but lack support for longer trips. In S and SV models, they’re thickly padded but lack full adjustment. Upper versions add a height-adjustable driver’s seat, so visibility is good. Adults can’t fit in the jump seats in King Cab models, while kids will have to live with thin padding and upright backrests. It takes a Crew Cab to carry four or five adults. Given its age, there isn’t much mechanical refinement to the Frontier. It tries, but doesn’t like it. The 4-cylinder is loud and often overwhelmed. Acceleration with the V-6 is brisk, but it’s an unpolished engine that growls and vibrates. Both manual gearboxes work well, although the throws of the shift lever are long. You might like that; more reminders that it’s a throwback truck. Clutch feel is satisfying. The 5-speed automatic transmission is good, with firm and predictable shifts that aren’t troubled by searching for the next gear. It can be difficult to maintain momentum with the 4-cylinder engine using an automatic, but the V-6 delivers strong power during two-lane passing. Even by pickup-truck standards, the ride tends to bouncy and busy; this choppiness is one product of a fairly short wheelbase. Constant corrections are often needed during highway driving. The steering is firm, handling relatively nimble, and the body lean controlled. Still, the Frontier doesn’t like being pushed hard on curvy roads. The Frontier family has some expensive members, and V-6 trucks have a lot of grunt. But if you’re comfortable with the character of an old-school pickup, and don’t want to spend a penny more than $20,000, the 2019 Nissan Frontier S might be for you. Who needs power windows in a pickup truck?